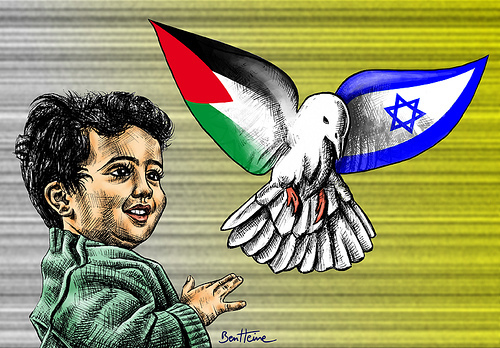 Middle East Peace; The Future is In Question(s)? “Darkness cannot drive out darkness; only light can do that. Hate cannot drive out hate; only love can do that.” -- Martin Luther King, Jr. In many ways, the last conflict on Gaza border this week was history repeating itself. It seemed both parties never learned a lesson from the previous conflict. From the time when United Nations General Assembly recommended the adoption and implementation of the United Nations partition plan on 29 November 1947, the region has turned into one of the blood-soaked, haunted region on earth. For decades, people who live in Gaza, Israel, and West Bank never able to see the day light without being afraid of the rockets or missiles that could ablaze their home anytime. This ongoing conflict makes its way to drew international attention. The grim and wrenching situations in Gaza rallied people from all over the world. On one hand, the throng chants, most of them blame Israel for the situation. On the other hand, The United Nations, as the most influential international organization on earth, tries its best to broker the conflict. Many talks, discussion, and mediations have been made. The 1993 Oslo Accord and Camp David Accords are one of them. The 1993 Oslo Accord, many people believe, was the most successful agreement ever achieved by both parties. Unfortunately, the assassination of former Prime Minister Yitzhak Rabin of Israel ruined everything, as both parties start breaking the accord. The United States as the strongest ally of Israel also tried to intercede the conflict. However, its leverage could not reach the conflict, not to mention solving or at least preventing the conflict. Not more than a week ago, people once again witnessed the escalation of the conflict on Gaza’s border from the media. As we tallying the victims, the world reacts, demanding cease-fire as soon as possible. Although cease-fire has been achieved, people still worry about the future, as they need acquiescence not a truce in words only. It is true that the onus is on people’s hand. However, government still has big responsibility in this case. That being said, other nations especially U.S. and Egypt share a big responsibility as the broker of the conflict. This very second, people are still rallying behind President Mohamed Morsi of Egypt, hoping that he would be able to cope with his domestic issue so then he can focuses on brokering the Israeli-Palestinian conflict. Let’s brushed aside for a moment the issues of religion, nationality and ethnicity; people are dying in Middle East this very moment regardless of their religion or nationality or ethnicity. Young man and women grew up in the middle of war. The future generations are getting used to the culture of violence. If those problems could not be solved, then our future is in question. Protesters flooding the streets of Cairo to protest what they call a dictatorial president. Violent clashes with police (CNN).